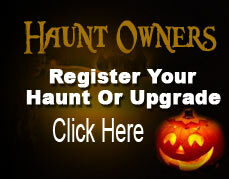 Award winning haunt on 6 acres in it's twenty seventh year as Northern California's Premier Haunted Attraction. Extensive use of special effects, robotics, actors, realism and animatronics. Real adrenaline pumping excitement - definitely not for the faint of heart! this ticket will NOT get you into any attractions, simply entrance in the gate to enjoy the ambiance and music. You can bring all of the kids you want, but remember that we provide an EXTREMELY frightening adventure that may not be suited for those of an impressionable age.